It just occurred to me that I have been writing this blog for over a year now. I started March 23, 2009 and here I am a year later. In this past year I have met and worked with some wonderful people, some I may never see again and some that I will be greeting again in April. I've worked as an Associate at Canyon in apparel, grocery, confections and as a hostess in the fountain. I've worked as a Dorm Lead, rang up sales on registers, made some lattes, scooped ice cream, guided guests to the restroom (still the #1 question) and stocked coolers and shelves. I've spent my winter in Mammoth and had the great experience of working a few Taco Tuesdays. I've even made it up to Store Manager (starting next Friday). I've watched the Dorm Bison, felt sorrow when DB was killed - as well as one of the Boys of Summer, watched Bob on the road between Canyon and Norris, marveled at the Magnificent One and was entertained by Big Boy, Trotter and Digit. I even dressed up as a Banana at the employee Christmas Party. Now I will be leaving my new friends at Mammoth and making new ones back at Canyon. Stay tuned for Year Two!! I took a quick trip to my place during lunch yesterday only to be greeted by Big Boy and friend in the Yak in the 'yard' next to mine. I didn't want to take too long at my place with fear that one of the two would make his way and graze between my front door and my car - thus leaving me unable to make it back to work (this happened once to a friend of mine at Fishing Bridge RV Park when she was heading to work). Luckily both decided to head off in another direction. Today during my lunch hour I had to head into Gardiner. I had to stop and go around a bighorn sheep standing in the road. It has been awhile since I've seen any sheep on my trips to town. 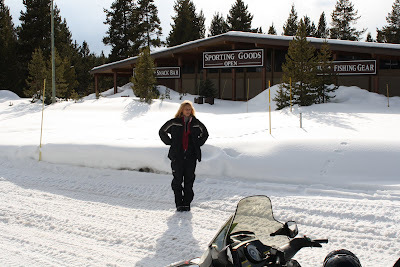 There is finally a nice layer of snow on the ground here in Mammoth but it is fairly warm so I'm sure it will melt quickly. There was about 6 inches of snow on the top of my car. Hunks would break off and slide down my windshield every time I hit my brakes (which is fairly often when going into Gardiner from Mammoth). Currently, as I write this, the 3 wolves are laying on the hill just down the hill from Mammoth. They have been regularly seen in the area the past few days. And my lunch break is now over, I guess it's back to work for me and wolf watching later. I didn't blow away last night though from the sounds of my roof rattling I thought I might. 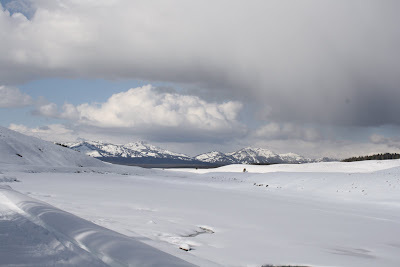 There is a winter storm warning for Yellowstone and the winds have been howling and it snowed most of yesterday. I saw some limbs that had been drug off the road after they came down in the median north of the Visitor Center yesterday. The only thing left in the road was a covering of pine cones from the limbs. None of the snow stuck to the ground here in Mammoth but there is a coating of slush over the roadways. The interior and higher elevations are expected to get quite a bit of snow. It is quite a contrast to the bright and beautiful weekend. I went to visit Patrick at Lake. 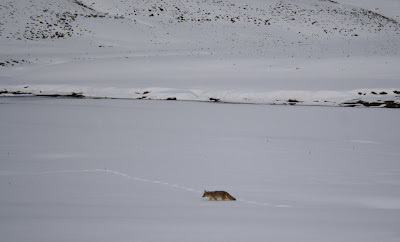 We watched some canines in Hayden Valley but since they were at quite a distance we couldn't tell if they were wolves or coyotes. It seemed most of the other animals were all in hiding since we really had to search to find even a bison, though we did see some across the river from Sulphur Cauldron, one wild and angry one between Canyon and Norris. We finally found a herd heading down the road when we took a trip into West Yellowstone. We stopped at Old Faithful but without eruption info we waited about 40 minutes and decided to head off without seeing it erupt. I did watch one erupt in the distance. Bicyclists were all over the roads enjoying their weekend in the Park. The story I found most interesting (and quite scary) came from a couple guys who came into the store earlier this week. They relayed to Connie how they were tenting at Slough Creek. During the night they hear a bear clawing at their tent. They were prepared with a canister of bear spray but unfortunately as one of the men fumbled with the container he accidently gave himself a good dose of the spray directly into his face. He's not the first person I've heard of getting their face sprayed with bear spray. The other person I know who got a facefull of bear spray is a friend from Canyon who got sprayed when a friend was demonstrating to her how to use it. The friend did then mention something about that being the 3rd time she had accidently sprayed someone. Yikes! I have bear spray, I've read how to use it but I hope that during a moment of panic I can stay calm enough to spray the bear and not myself. In the case of the men the bear eventually went away but one man had a teary memory of his close encounter with a bear where only a thin piece of nylon seperated him from the it. The bison that met me on the road as I made my way into work on Monday. After work last night I stopped to snap a couple of pictures of the elk in front of the Mammoth Hotel. And of the bison grazing in Mammoth. This is the herd of elk that I watched race around Capital Hill last month when people climbed the hill and spooked them. One problem with living in Yellowstone is the technology difficulties that I sometimes face. I printed a letter on my computer, saved it to my sandisk cruzer and headed into Gardiner to print it off at the only place I know to have a printer that I can use. Alas, the programs are not compatible and I am facing a 1 1/2 hour drive to Bozeman to find a place that can print the letter for me. Thank goodness it is a beautiful drive but I hate the idea of wasting so much time and gas to just print a letter. Maybe I need to invest in a printer for my computer. 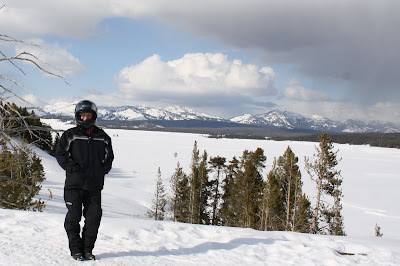 I have started my countdown to my departure from Mammoth. Two weeks from tomorrow I head behind locked gates and into the interior. The Adventure Store is scheduled to open April 16 when the roads open to the public. Yellowstone Greetings to: Maryellen, Jonathon, Becci, Jayson & Diana. Thanks to all of you for writing! After a week of sunny and fairly warm weather I awoke to snow. Not much is sticking to the ground here in Mammoth but it is beautiful to watch it fall. It will probably snow just enough for the mud outside my place to get nice and gooey again. Such is life. On my way to work I had to stop as 2 playful bison ran up the road. I have been constantly seeing 3 of them outside the North Gate grazing as well as the antelope and elk. They have now moved up toward the Yak by the terraces. Their huge husky bodies are all snow covered and they look very regal standing there with the terraces as a backdrop. Incredible animals. 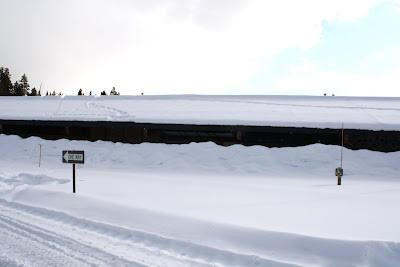 The winter season is slowly winding down and I miss the rumbles of the snowcoaches going by and the excited tourists as they plan their trips to Old Faithful. The tours that come in always put a bit of excitement in the day and we've even had a few incredibly busy Fountain days because of photography groups coming into the Park. There are only 3 more Taco Tuesdays left. The end is in sight. 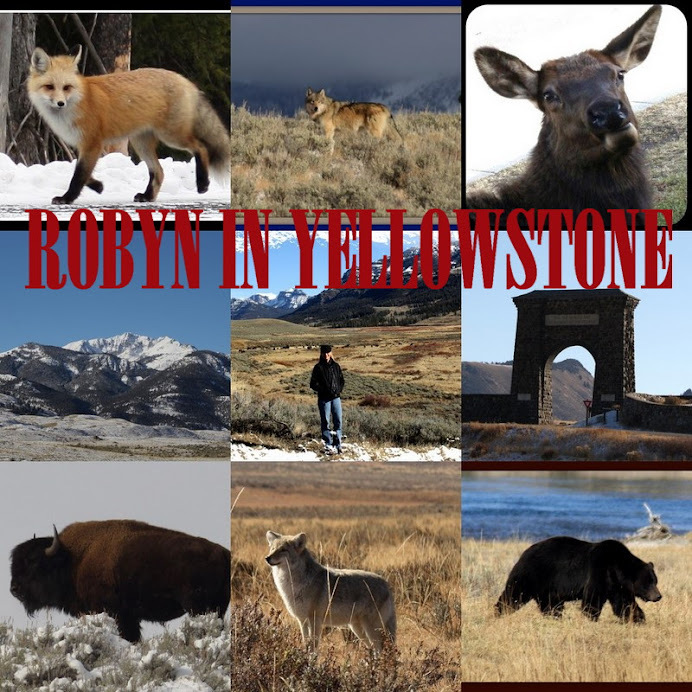 I will be heading down to start at the Adventure Store April 9 and there I will start my new Yellowstone chapter. If my life was a book I have a whole lot of empty pages yet to fill! In the past 1+ years not only does my friend Terry get to be an extra in the movie Up In The Air (plus get to ride in an elevator with George Clooney) but he also gets to have dinner with moi and get a mention in my blog (Hi Terry!). It is always nice to have friends come to the area where I can catch up with them. Though Terry didn't get to make it to the Park I did get to have dinner with him (and try some very tentacley calamari - now that I've done that I won't need to try that again) in Bozeman. On your next business trip to the area plan on having a great tour of the Park. I've decided some time ago that Gardiner is an interesting town to drive through. Not only do I have to watch for elk sauntering down the road but the deer also meander around town and sometimes I have to come to a complete stop on the bridge as they wind their way across it. It is a Who's Who at the local Food Farm where I seem to find people I know to visit with. I'm even driving through the Park or Gardiner having to be prepared to wave at a moments notice. I know I'm far from being from any sort of 'local' but it is a good feeling recognizing people and greeting each other. For the past few months I have been tolerating a visiting rodent that I named Rodney. I only tolerated him since it seemed he would vacation at my place occassionally. And though I never saw him (until the other day) he left his signs on the floor about every other week and would then apparently slip off to visit another place. Then he made the fatal mistake of leaving his mark on the kitchen counter. Patrick to the rescue with the jaws of death. The kitchen counter was taking it too far. RIP Rodney. Bison have moved into the Yak. Big Boy is there with a couple of his friends. They usually are lounging at the end of the road and leaving huge bison tracks in the mud by my car. I have been waiting for them. The elk move through on occasion but I mostly see a huge herd on my way down the hill to Mammoth. Yesterday morning I could hear yips and howls outside. Not sure if I was listening to some mouthy coyotes or wolves I went to my kitchen window and peaked out. There were 3 wolves in the opening enjoying themselves and doing a lot of communicating. I watched them for awhile and then just sat down and listened. What a great experience to see and hear them from my place. With the hotel closed in Mammoth I realize how much I miss seeing the familiar faces of people who work there and come into the store on a regular basis. One thing about living in the Park and moving back and forth between locations is that a person can see people for a few months and then not see them again for months. Some of the Xanterra employees that I've gotten to know here in Mammoth will be in Canyon for the summer so I hopefully will run into them again this summer. Some I will not see again until next November. The same goes for the park service employees that I've gotten to know. This past week the Marlboro Tours started again. 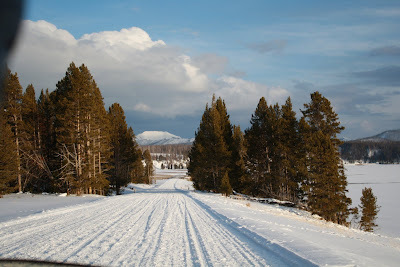 Marlboro owns property by Livingston and their guests get to take advantage of all sorts of Montana activities. 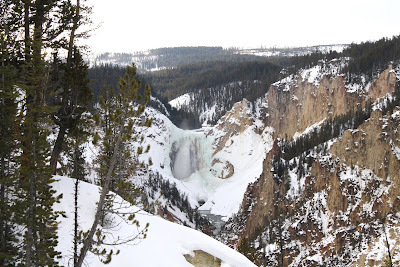 Visiting Yellowstone had been dropped from their agenda this past winter but with the lack of snow they decided to include it again. Two to three times a week a bus full of approx. 40 visitors stop to see the wonders of Yellowstone and do some shopping in the Mammoth General Store. The people are dropped off at the terraces where they visit and soon a sea of red coats (supplied by Marlboro) come floating down the boardwalk toward the store. It's almost like summer in the store with wall-to-wall shoppers. I rather enjoy it. A man came to the store a couple days ago and laughed as he told me a story of driving up to the Blacktail and having to follow a coyote down the road as it meandered back and forth. Of course I knew exactly who he was talking about: Trotter. He still is making his roadly appearances. Last evening, with perfectly clear skies, I decided to head out to the Blacktail myself to do some star gazing away from the 'city' lights of Mammoth. My headlights reflected off a pair of eyes on the side of the road. It was Trotter. Same place, same modus operandi just a different time of the day. I hadn't seen him for awhile (because of my lack of Lamar trips recently) so it's nice to see an old friend. I found bison tracks in the mud outside my place the other day. The weather has been very warm and the skies are a beautiful blue. The warm weather has made the ground outside my place extremely muddy and I tend to squish into it with that muddy sucking noise. I am constantly clicking my shoes (hiking boots, no ruby slippers here) together to get it off. There is no place like home. First of all I need to thank people for the offers to help me recover my pictures from my snowmobile trip into the interior. As you can see they have been recovered!! (Insert huge sigh of relief here). 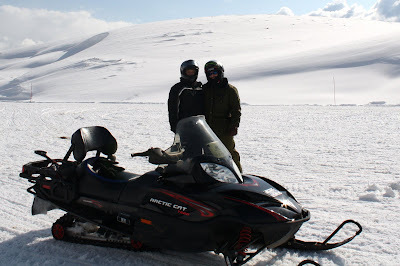 My friend Patrick had invited me on a snowmobile trip into the interior (to Lake to be exact). 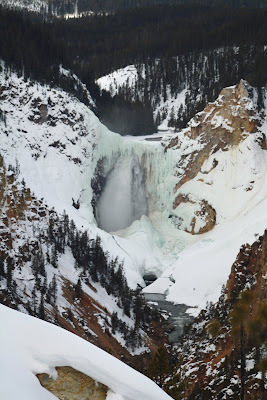 At this point in my Yellowstone adventure this has to top all my experiences thus far. My first notable sighting was a lone bison before Roaring Mountain. Could it be the Magnificent One that I had watched the last few months of summer in that area? I don't know but I've decided that I will always consider a lone bison in that area the Magnificent One. With the snow it was hard for me to imagine my past summer here with the doors open, the summer thunder storms, watering the flowers out front and pumping out the ice cream cones to cool down the guests. 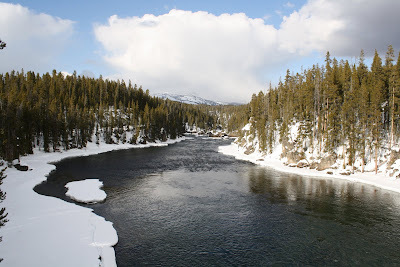 The Yellowstone River had numerous swans swimming in it. I saw quite a few in Hayden Valley down toward the bridge by the Upper Falls. Beautiful birds! Every time we passed open water we looked for otters swimming but only managed to find one on our way back to Mammoth. We stopped to watch the otter which didn't seem to realize that it was supposed to entertain us with the normal otter antics. It just hung out under an ice overhang on the river's edge and really didn't do much of anything. But I can now say I have finally saw an otter. And of course we saw it by Otter Creek. I remember hearing the falls in my dorm room at Canyon. I also remember thinking it sounded like an airplane. 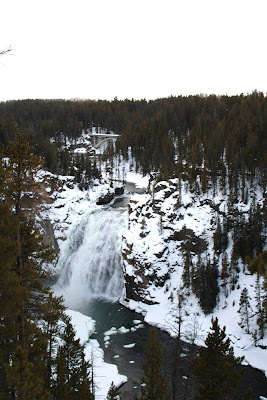 Though there is quite a bit of ice on the waterfall we could still hear the thundering sound of the falls. I can't imagine going anyplace now without seeing a coyote. I saw a couple on my way down to Lake but this was the only one I saw in Hayden Valley. What can I say? 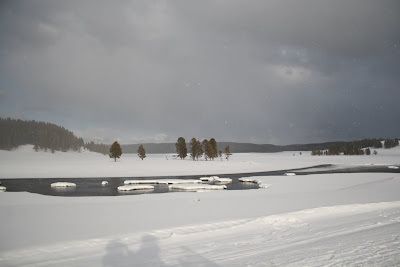 I love Hayden Valley and it was a thrilling experience to see it in winter. There was only small bison herd in the valley and it was at quite a distance. On our way past the Nez Perce area we had to slowly follow 3 bison who slowly ran in front of us for quite a distance. One large bull ran while two others bumped and butted each other in what appeared to be a rather playful attempt at entertainment. They eventually left the roadway and let us pass. 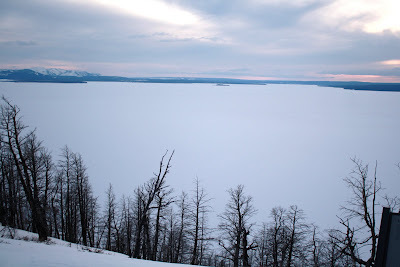 The sun was going down by this time and the sky was pink over a frozen Yellowstone Lake. What a view!! !